Synopsis: In the real world, when you vanish into thin air for a week, people tend to notice. After his unexpected journey into the lands of the fey, Ethan Chase just wants to get back to normal. Well, as normal as you can be when you see faeries every day of your life. Suddenly the former loner with the bad reputation has someone to try for; his girlfriend, Kenzie. Never mind that he's forbidden to see her again. But when your name is Ethan Chase and your sister is one of the most powerful faeries in the Nevernever, normal simply isn't to be. For Ethan's nephew, Keirran, is missing, and may be on the verge of doing something unthinkable in the name of saving his own love. Something that will fracture the human and faery worlds forever, and give rise to the dangerous fey known as the Forgotten. As Ethan's and Keirran's fates entwine and Keirran slips further into darkness, Ethan's next choice may decide the fate of them all. 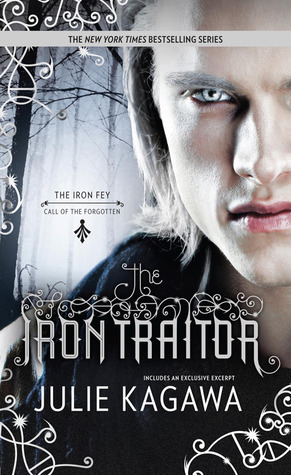 What I Thought: Some of you may know, I haven't actually read the original Iron Fey series. I read The Lost Prince, because it sounded awesome, and it was - so of course I was super excited for this one to be released. Now I don't know whether it was just me, or bad timing, but it took me waaaaay too long to get into this one. I mean, considering how much I loved the first one, and how long I waited for this one, it just didn't fully grab me the way it should have. Maybe it was because it felt so much like the first one - just slightly different. So there is Ethan being badass. Again. There is Kenzie being sick and kind and bossy. Again. There are fey fights. Again. There is betrayal. Again. Of course the details are different, but generally I felt it was the same stuff. There was a wicked fey beastie that needs slaying, which was kind of awesome. But I didn't let this put me off, because I am the kind of person who needs to read the entire sequel book. Puck made an appearance as did Grimalkin, and of course Ash (although that didn't make a huge difference to me because I haven't read the original series in which I would have met these characters long ago). "I love you," I whispered, my voice just a murmur between us. No fear, no hesitation; it was just pulled out of me, unable to stay hidden any longer. The KILLER KILLER cliffhanger ending certainly piqued my interest for the third book in the series, currently Untitled, so I really hope the third book can bring it back for me. The Good: Kagawa certainly knows how to leave you wanting more! The Bad: I just didn't feel the love for this book as much as I had hoped.